Grandmaster Flash and the Furious Five fomented the musical revolution known as hip-hop. Theirs was a pioneering union between one DJ and five rapping MCs. Grandmaster Flash (born Joseph Saddler) not only devised various techniques but also designed turntable and mixing equipment. 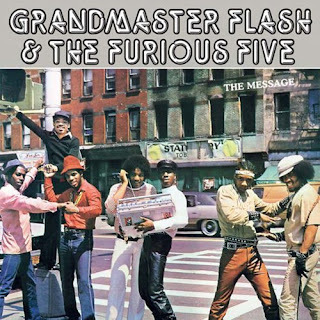 Formed in the South Bronx, Grandmaster Flash and the Furious Five were one of the first rap posses, responsible for such masterpieces as “The Message,” “Grandmaster Flash on the Wheels of Steel” and “White Lines.” The combination of Grandmaster Flash’s turntable mastery and the Furious Five’s raps, which ranged from socially conscious to frivolously fun, made for a series of 12-inch records that forever altered the musical landscape. Flash, along with DJ Kool Herc and Afrika Bambaataa, pioneered the art of break-beat deejaying—the process of remixing and thereby creating a new piece of music by playing vinyl records and turntables as if they were musical instruments. Disco-era deejays like Pete “DJ” Jones, an early influence on Grandmaster Flash, spun records so that people could dance. Turntablists took it a step further by scratching and cutting records, focusing on “breaks”—what Flash described as “the short, climactic parts of the records that really grabbed me”—as a way of heightening musical excitement and creating something new. A permanent Museum exhibit that celebrates the lives and work of Hall of Fame inductees. The Rock and Roll Hall of Fame honors the legendary performers, producers, songwriters, disc jockeys and others who have made rock and roll the force that it is in our culture. I'm still buzzing off of Grandmaster Flash and the Furious Five being inducted into the Rock of Roll Hall of Fame. It was so big for me when we got to interview Grandmaster Mele Mel over at Highbrid Nation. As a person who grew up on hip hop, I'm just glad to see it being respected.